Alan and I both owe Dr. Fuhrman a debt of gratitude for helping us and giving us a sense of control for our health destinies. Not only that, but there is so much admiration of how he has put together a program with the only parameters being disease prevention and longevity without being influenced by corporate America or any other distractions or pressures. He is so obviously devoted to science and rational, common sense. Every day has started with exercise and breakfast and then lectures. My favorite presentation so far has been on “Maximizing Human Performance and Longevity” where Dr. Fuhrman presented data on how we can have the highest quality of life for the maximum quantity of time. He pointed out that 100 years ago, the average American was only sick about 3-6 months at the end of life whereas Americans now spend the last 10 years of their life sick. In this same lecture, he discussed the research on the inclusion of nuts and seeds in a vegan diet and how the results show that is the most favorable scenario as opposed to vegan diets that do not include nuts and seeds. Without going into all the details, I’ve learned so, so much from these lectures and it’s going to take me a few days or weeks to comprehend it all. I’m happy that I’m already nearly two years into this program, but there are some definite changes I will be making and I’ll be sure to share those with you. 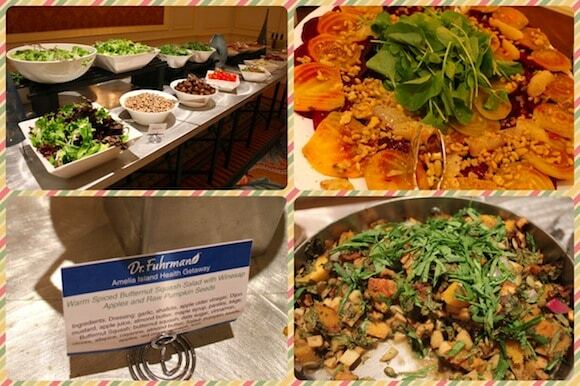 Besides the information-rich lectures from Dr. Fuhrman with the latest nutritional research and having delicious, healthy food available for three meals a day, the best part of this trip by far has been meeting other people interested in the program. 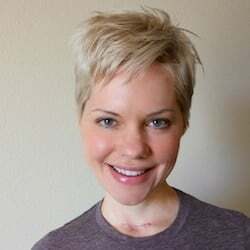 Since we as vegans or near-vegans so often stick out in our society for the choices we make, the feeling of being part of a community and surrounded by friends has been priceless and is similar to what I felt when I attended Vida Vegan Con in August of 2011. I’ll be doing more posts when I get home about my experience here. At this point at the end of the week, I’m starting to feel saturated with information and like I haven’t been able to process everything. Fortunately, the last days of the Getaway consist of mainly cooking demos and Q&As with Dr. Fuhrman and spending time with the new friends we’ve made. I don’t want to take away from our Healthy Vegan Friday blog party that happened this week, but this is a slightly abbreviated post on that front. I wasn’t able to spend time reading your entries, but my co-hosts Shelby and Gabby are on top of it and you should check out their favorite entries. Congratulations, ladies, and thank you to everyone who contributed! I cannot wait to hear about this trip in more detail! You must have so many amazing things to share with us. Enjoy the rest of it! 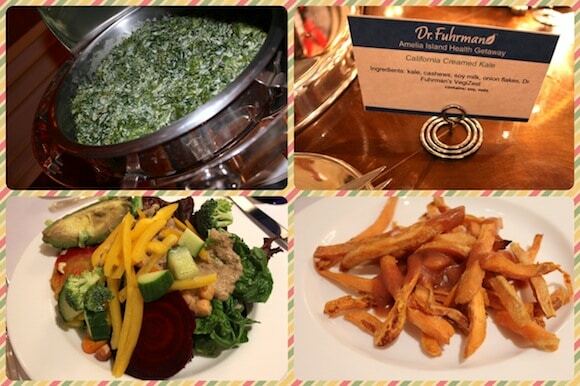 The California Creamed Kale and Butternut Squash Salad were my favorite dishes too! Good morning, Carrie! Looking forward to hearing more about your trip. I am submitting my avocado chickpea pasta. Very allergy friendly and delicious! Thank you again for hosing. Great, Sarina, I’m so glad you are participating! what great photos! it looks like you had an awesome time at the convention!! Thanks for hosting! have a great weekend! I already predict I will be begging Matt next year to go to this! Thanks for the update on the getaway. I wanted to go but can’t due to finances and starting a new job. But I would love to see more pictures if you have a chance to post it on your blog. So glad to hear from you! You must have got a lot of information that needs to be digested … so we just wait with anticipation 🙂 Nice pictures! Have a safe journey home! 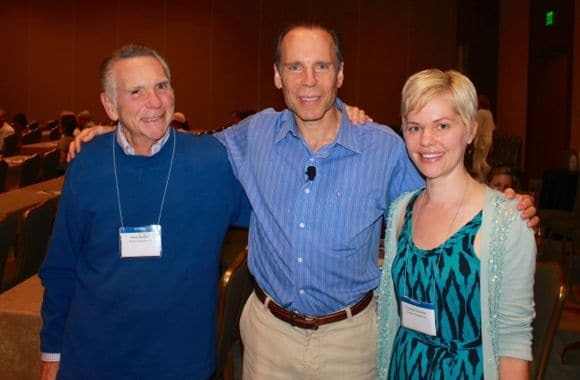 How wonderful to meet Dr. Fuhrman and have the experience of being in a group of people who share your interests in wholesome nutritious foods. I just had a similar experience (not food, but school related) and am still buzzing with excitement trying to process everything I learned, so I can sort of relate to how you must be feeling. Enjoy the remainder of your trip and we look forward to hearing more about your experiences! Also, the food looks fantastic. That’s healthy vegan heaven! Carrie!!! How exciting that you met and shared time w/Dr. Fuhrman! I can only imagine how thrilled you are! I’ve been so busy lately and haven’t kept up w/your blog 🙁 bad, me! But I have seen your FB posts and couldn’t wait to sit down and read your posts – awesome!!! Hope your travels back to CA are smooth sailing; much more so than to FL! Thanks, Ginny! No worries, it’s been a busy summer, hasn’t it? I hope things will calm down a bit in the fall for me as well, but I’m not sure if that will happen. Oh well, as long as we’re having fun, right? Hugs to you!